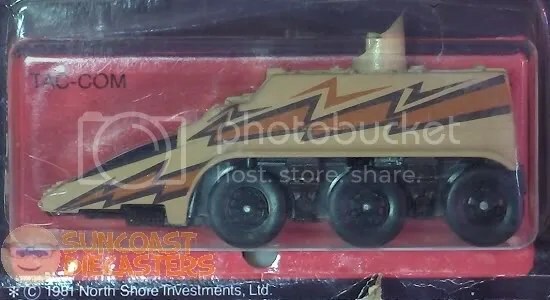 …And here be the mack-daddy of MegaForce collectibles: The TAC-COM command vehicle. 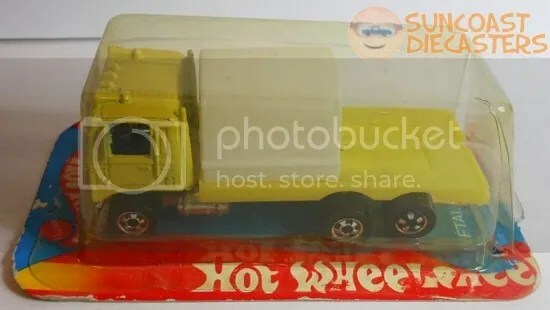 Very nice miniature; the full-size working vehicle in the movie bounces around like it’s made of maybe four pounds of plywood, but at least the toy turned out nicely. 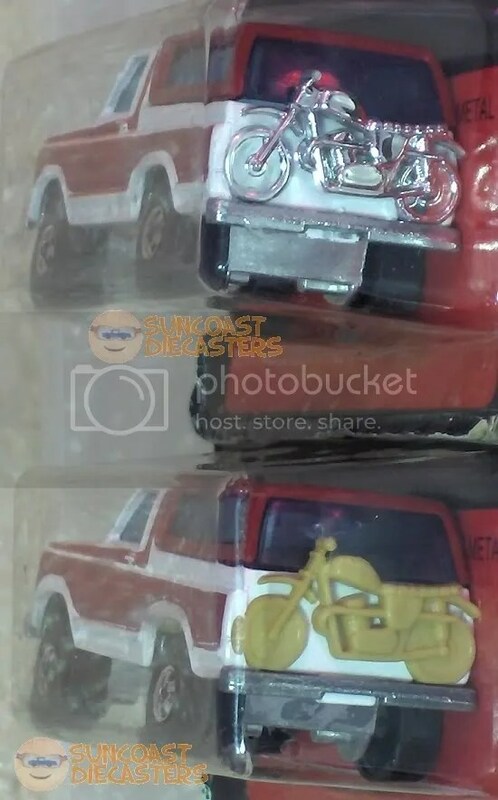 Mega Destoyer. 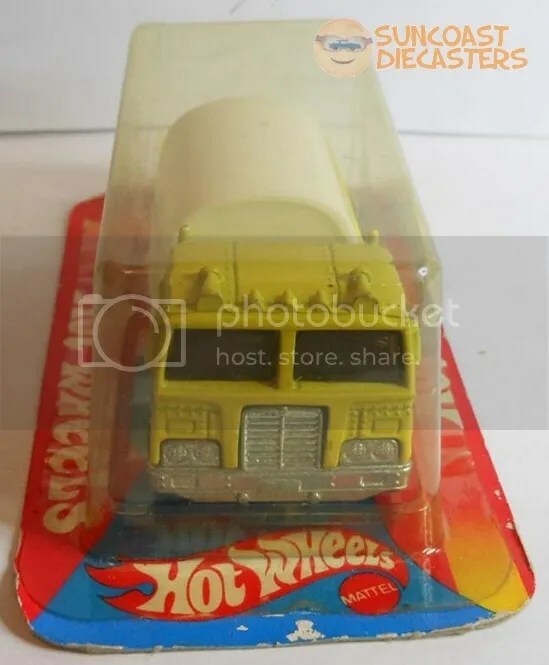 Also known as Enforcer, or … heck, pick a name, Mattel’s probably used it during the countless re-issues of this model. Mega Destoyer, night mode. 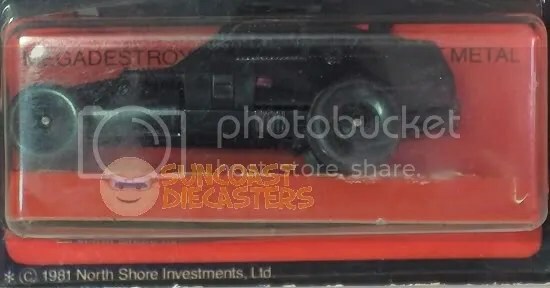 See, in the movie, a Mega Destroyer’s systems could “detect” when it was night, and change the armour to black so the vehicle would be all stealthy. Personnel Carrier. 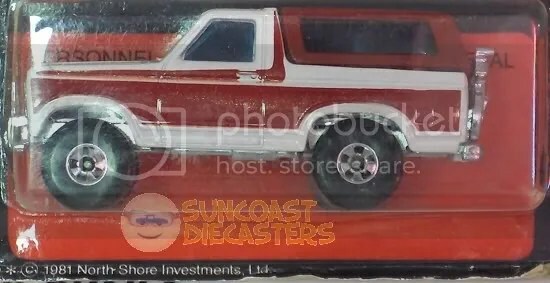 Based on the Bronco 4-Wheeler. Ha! Bet you think I just mistakenly copied the above section, don’tcha? 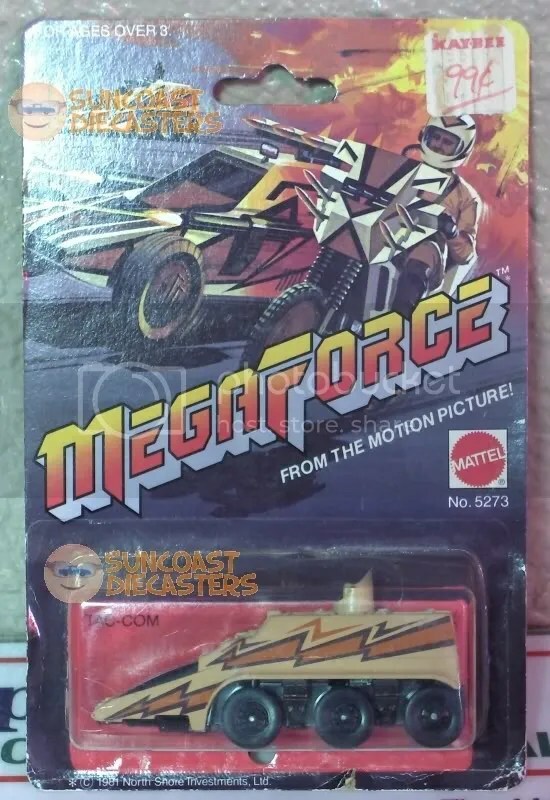 Nope, if you look carefully at the two photos above (or with normal awakedness at the photo below), you’ll see there are two versions of the MegaForce Personnel Carrier. 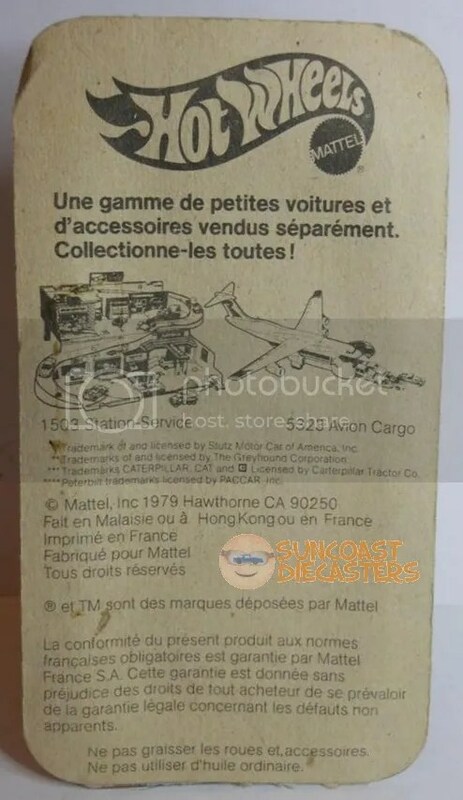 Mike C.’s brother gave him a very rare Hot Wheels, mint in the package: it’s the Cargo Lift from France, still in the Frech cube! The Cargo Lift seems to be based on Hiway Hauler, or perhaps American Tipper, or maybe American Hauler. Mike C. bloody well added this fair mate to ‘is collection: The exceedingly rare Sir Rodney Roadster. A fine gent from London-town, and no mistake! Coo, wha’ a sight! I’ll let Mike explain this shot, from his e-mail: From Right to Left; Red Line Yellow, super hard to find. 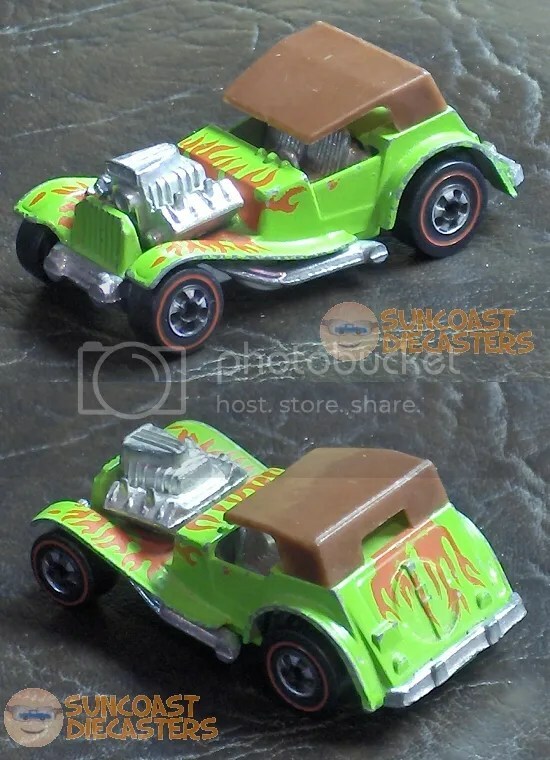 Green I picked up from Big Tractor Mike; Ultra rare Orange, orange is the rarest of the Sir Rodney Roadsters; next is Black wall Yellow and the Metal one from France. Thanks, Mike! 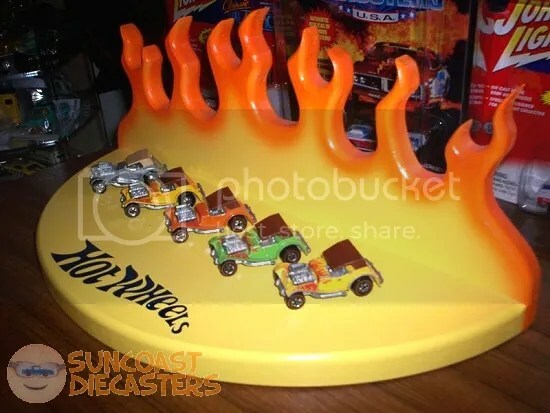 You told us everything, except where you got that sweet Hot Wheels display…. Hi. How can do I to get those Bronco 4 Wheeler? Good to hear from you, Fabio! 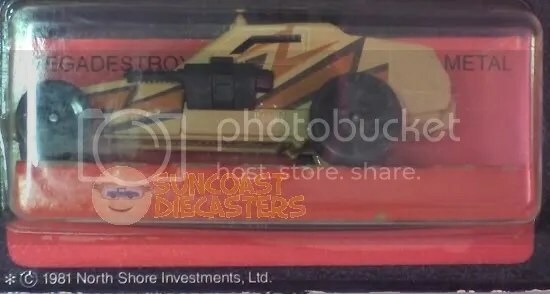 I’ll talk to Mike C.; however, it’s my understanding that they’re part of his “private collection” and are not for sale.